Dingle Leigh Railway came into being in the beginning of 2009 after I had found a copy of Garden Rail magazine and realised that there was such a thing as live steam at a scale I could do business with. The line is a simple enough loop with a track across its middle which splits into two at the halfway stage to permit reversal of the direction of travel. The track is 32mm peco laid on Thermalite blocks but only half of it has yet been ballasted. Lady Anne built last winter from the kit. All are fitted with Summerlands chuffers and Lady Anne has a whistle. I am still undecided about the benefits of R/C, despite the fact that all but the Millie have it fitted. The rolling stock is a mish mash of bought second hand and kit built. I am devoted to weathering. concrete, I am now experimenting with expanded polystyrene to create a reasonable copy of the village church. If I built it using jigstones, I'd never lift it! I want my line to demonstrate several of the common features of a variety of lines both current and obselete and in that respect it more resembles one of those restored and maintained lines like the Welshpool and Llanfair. That permits me to deviate from one era or even one geographical area. It allows me to deviate from prototypical narrow gauge practice. I can have as much fun as I like with tunnels and viaducts that have little engineering relevance to the true neeed of my site. I love semaphore signals, including ground signals, so I want some to muck about with on my line. The world I am creating is, by definition, a fantasy world. 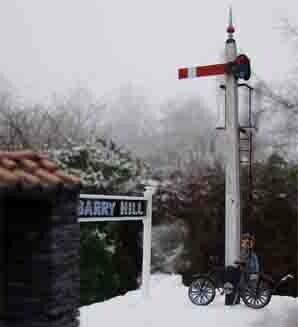 My stations are Benbril, St Edmonds, Barry Hill and Malcolm Fountain. The first two are named after my sons in law (Ben Brill and Edmond Keohane) and the last two are my neighbours who happen to have names that sound like places. I could have easily named one Hobbiton and another Ambridge. Because it is a fantasy, i think Rob Bennett's busybodies are perfectly suited, simply because they could not possible be mistaken for real people. They are Hobbits. Here for example is Frank who is really unsure about whether to climb that ladder to set the lamp. I don't blame him.